Our Constitutions, in Art. 170, describe the Provincial Chapter as “the fraternal gathering in which the local communities strengthen their sense of belonging to the provincial community, through their common concern for its general problems. It is also the representative assembly of all the confreres and local communities.” The article proceeds to enumerate the tasks of the Provincial Chapter and these are specified in Art.169 of the General Regulations. I hereby convoke the Provincial Chapter of 2019. 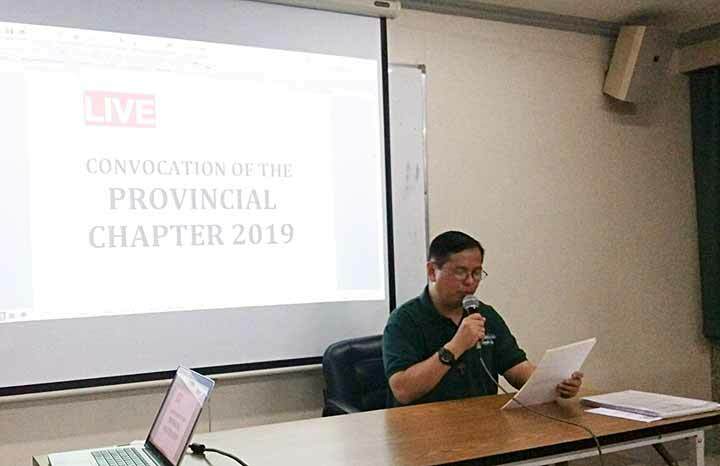 The Provincial Chapter 2019 will be held on April 28-May 4, 2019 at Don Bosco Batulao Retreat House. Primarily and principally it will study the theme of the GC28: What kind of Salesians for the youth of today? It will elect the Delegate (or Delegates) to the General Chapter and their substitutes (C 171, 5). It will deal with other matters of more immediate concern to the province that may be identified later (C 171, 1-2). After receiving the Rector Major’s letter convoking the GC28, we have appointed Fr. Joel Camaya as the Moderator of the PC 2019. He will aid the Provincial and his Council, and the rest of the Province in analyzing more deeply the purpose and topic of the GC28, and to clarify the objectives of the Provincial Chapter, which is to prepare it, to take notice of the study outline on the theme assigned to the GC28, to study the norms governing the preparation and carrying out of the provincial chapter, and to invite possible experts and observers to the chapter (R 168). We also appoint a Preparatory Commission to help the Moderator in preparing the provincial chapter. Fr. Joel Camaya will himself head this Commission. The members of this Commission will be Fr. Gerardo Martin, Fr. Jose Lorbeth Vivo, Bro. Carmelo Martinez, and Fr. Umijun Binueza. This Commission will study, suggest to the Provincial, and foster all the initiatives it may consider useful for sensitizing the confreres to chapter perspectives, helping the confreres to prepare themselves spiritually for the work and obligations associated with the chapter, and clarifying the chapter theme and helping the confreres in their study of it: every confrere could well be given a copy of the letter convoking the GC28, of the study outline found elsewhere in this edition of the Acts. The Moderator of the Provincial Chapter will decide and inform the communities of the dates by which must take place the election of the delegates of the communities and their substitutes; the delegates of the confreres of the province, and (from the provincial list); eventual new substitutes for community delegates if a substitute is subsequently elected from the provincial list as a delegate of the confreres. He will send to the communities the norms governing the election of the delegates of local communities and the forms for recording the minutes of their elections and will also announce the method to be used for the election of delegates of the confreres of the province. will study the contributions and proposals sent in by the communities and confreres, and arrange them in a manner which will facilitate their use for the Provincial Chapter’s reflection and decisions. Finally, I wish to suggest some duties of the communities and individual confreres. Accompany the whole of the capitular process by their daily prayer. Elect their delegate to the provincial chapter and his substitute. They compile the minutes of the election, following the model supplied by the Moderator of the PC. Receive and study the motives and material sent them by the Moderator of the PC. Deepen their knowledge of the theme proposed in view of the GC28, and submit contributions and proposals to the Moderator of the PC. Follow, through information and prayer, the preparation, realization and conclusions of their provincial chapter. A climate of personal conversion is proposed so as to assume the spiritual and pastoral implications of the topic for GC28, “What kind of Salesians for the youth of today?”. Vote in the election of the delegate of their own community and his substitute. Take part in the election of the delegates of the confreres of the province. Submit personal contributions and proposals to the Moderator of the provincial chapter and collaborate in the drawing up and discussion of proposals and contributions from their own community. Send, if they so wish, personal proposals and contributions directly to the Moderator of the GC28, using the appropriate forms. I wish all the Confreres—members of the FIN Province, and those of our Provinces residing in the FIN Province, to actively participate in this undertaking of preparing for the Provincial Chapter and celebrating it, a beautiful task of making Don Bosco continually present among the youth of today. Follow the dreamer and DREAM!